The Opportunity rover has been trekking across the Martian surface since 2004, but this past Sunday its odometer clicked past the 25-mile (40-km) mark, establishing a new off-world distance record. It's a remarkable achievement — so whose record did it smash? The answer is the Soviet Union's Lunokhod 2 Rover. This probe trundled along the lunar surface from January 11th to May 11th, 1973, covering about 24.2 miles (39 km) in less than five months. This figure was only recently established after NASA analyzed images of Lunokhod 2's tracks taken from the Lunar Reconnaissance Orbiter (LRO). Interestingly, the Apollo 17 Lunar Rover is in third place, with 22.2 miles (35.74) km accrued. After progressing 157 feet (48 meters) this past Sunday, July 27th, Opportunity established the new record. "Opportunity has driven farther than any other wheeled vehicle on another world," noted Mars Exploration Rover Project Manager John Callas in a statement. "This is so remarkable considering Opportunity was intended to drive about one kilometer and was never designed for distance. But what is really important is not how many miles the rover has racked up, but how much exploration and discovery we have accomplished over that distance." This month's driving brought the rover southward along the western rim of Endeavour Crater. The rover had driven more than 20 miles (32 kilometers) before arriving at Endeavour Crater in 2011, where it has examined outcrops on the crater's rim containing clay and sulfate-bearing minerals. The sites are yielding evidence of ancient environments with less acidic water than those examined at Opportunity's landing site. 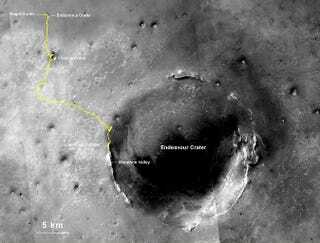 If the rover can continue to operate the distance of a marathon — 26.2 miles (about 42.2 kilometers) — it will approach the next major investigation site mission scientists have dubbed "Marathon Valley." Observations from spacecraft orbiting Mars suggest several clay minerals are exposed close together at this valley site, surrounded by steep slopes where the relationships among different layers may be evident. In honor of the previous record holder, the rover team chose the name Lunokhod 2 for a crater about 20 feet (6 m) in diameter on the outer slope of Endeavour's rim on Mars.